Next TPC meeting Sat. April 27th about Winnipeg philatelist & philosopher O. Kendall and ‘The Hobbyist’. Here’s an interesting winter-themed card, showing women skate-sailing on Blair’s Lake, a small lake on the outskirts of Amherst, Nova Scotia (it looks like they could use a bit more wind!) As we quickly learn from Edwardian postcards, Canadians of the time — men and women alike — were up for just about any sort of sporting activity in wintertime, no matter how absurd! 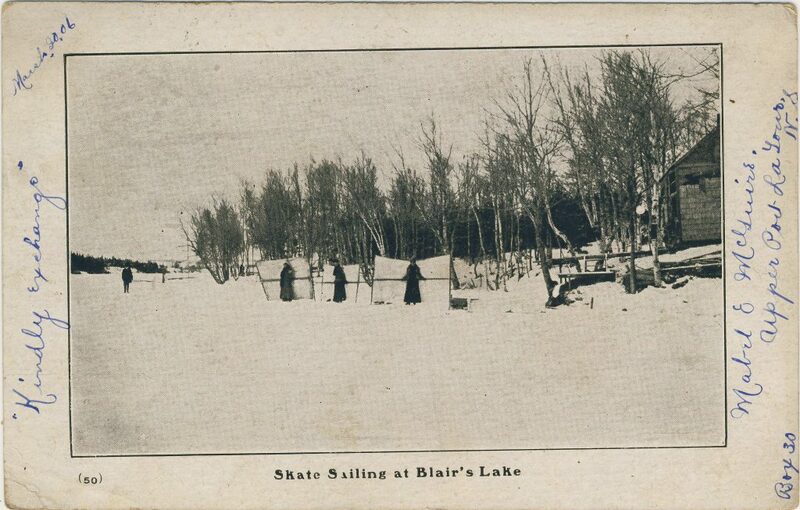 Skate Sailing at Blair’s Lake, dated March 20, 1906. 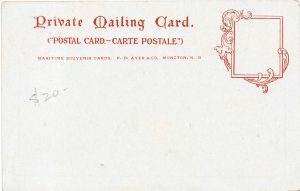 Reverse of the Blair’s Lake “Private Mailing Card”, printed by Black Printing Co., Ltd., of Amherst. The interest of the card extends beyond the image. For one thing, the card stock is coloured on the reverse but plain on the picture side, an unusual and (one imagines) costly effect that definitely lends the card a touch of class — offsetting the limitations of the half-tone image. As noted, the printer was Black Printing Co., Ltd., of Amherst. 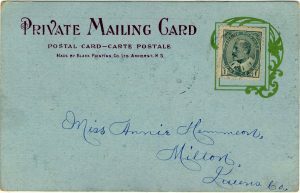 Postcard aficionados will also note the non-compliant “PRIVATE MAILING CARD” title, a designation that was required under U.S. law between 1899 and 1901 but wholly improper under Canadian postal regulations. I have seen U.S. wording on Canadian postcards before, but not, to the best of my recollection, on a back that was clearly printed in Canada rather than having been imported from the U.S. Other examples of this kind would be interesting to see. 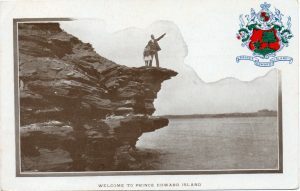 “PRIVATE POST CARD” was the Canadian standard established (as Steinhart tells us) in the Official Postal Guide as of December 29, 1894. 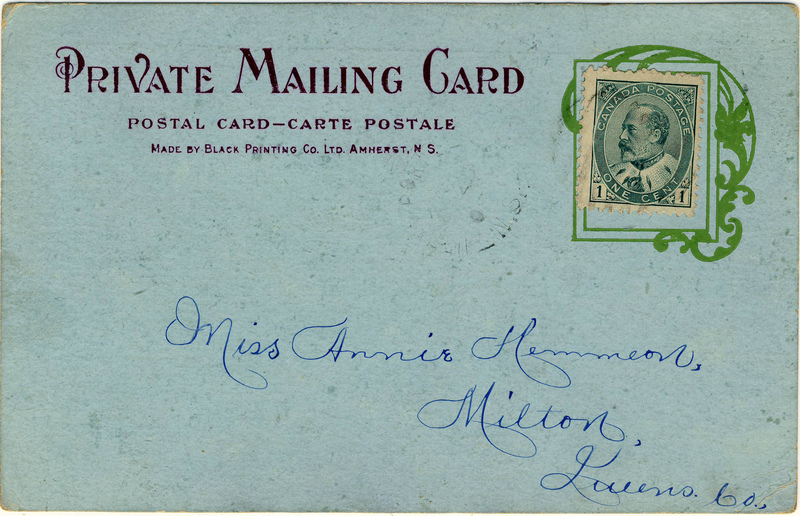 The card itself was posted in 1906, long after plain old “POST CARD” had become the norm in both countries. 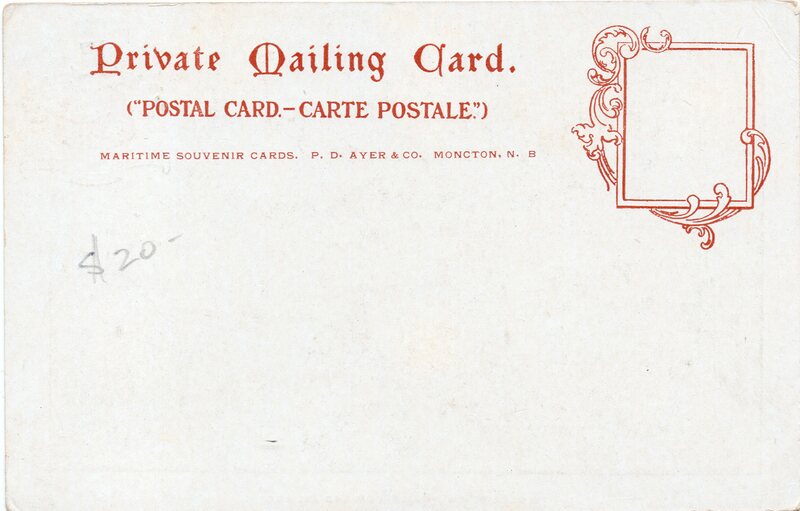 Reverse of the card, with the PRIVATE MAILING CARD design from P. D. Ayer & Co.
Error: Error validating access token: Session has expired on Friday, 12-Apr-19 20:21:58 PDT. The current time is Tuesday, 23-Apr-19 21:17:57 PDT. © The Toronto Postcard Club | Webmaster: Empower You Web Solutions Inc.